As you may know, I've been slowly redoing my scraproom. Just recently, I got my new valanaces. I knew I wanted to use Heather Bailey fabric. Well, I found a wonderful semastress to make them! I was online one night and I googled Heather Bailey Valance. Lo and behold it brought me to Jessica's blog. She had made one in the exact fabric I wanted. I emailed her...and the rest was history. If you need any custom work done, I highly reccomend her! She does beautiful work. Check out her blog. She has some of the most wonderful embroidery pieces I've ever seen! Plus, she's fast and a pleasure to work with. She sent me all of the scraps and I used them to spruce up the place. ;) One piece serves as a runner and another covers a bookshelf full of cardstock. I also used some scraps to tie bows onto my baskets. My room is so much more colorful now. Thanks so much, Jessica! I'll leave you with a quick project. I love coloring my crystals to create custom designs. 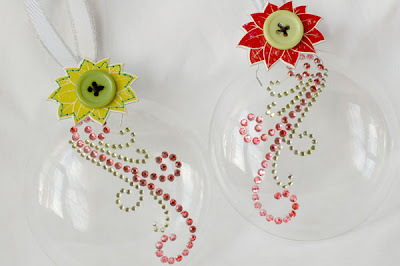 To create this project, I colored them with Copic markers and adhered them to clear ornament bulbs. 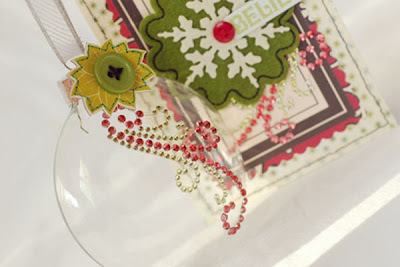 I created a matching card using some Making Memories and Jenni Bowlin papers. gorgeous projects and gorgeous scraproom!! i'm in awe on both accounts! 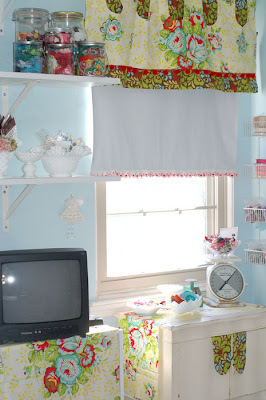 The valances are so cute! Great project. Love your new projects. That material is fab! Love your redo! It is so pretty and feminine. I didn't know you could color the crystals. Learn something new every day. Your scrap space is sooooo pretty!!! Love the valences! Love the card and ornaments too!!! 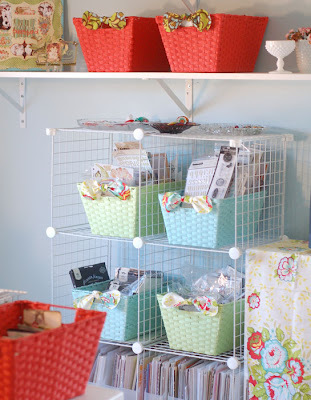 Oh my... your scrap room looks so beautiful!! Can I move in? ;o) Great card, too! 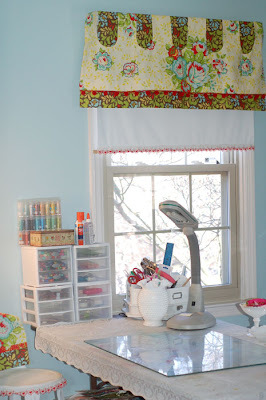 Beautiful valances and decorating touches. Love the pale blue wall color as well. 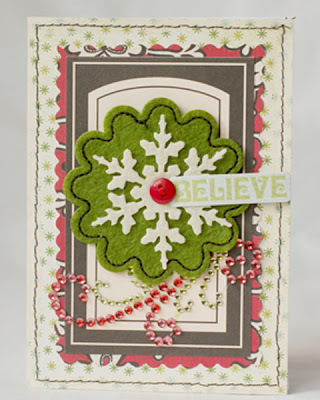 Super cute card - the green felt embellishment is great. Your room looks beautiful, Anabelle!